We are proud to introduce the New patent pending, Springfield XD 9mm series Red dot optic mount, allows anyone with a Springfield XD9mm handgun, to instantly install a red dot optic or reflex sight onto their handgun, with no machining or special tools necessary. This new and improved, lightened design, make the perfect stable platform to mount any Vortex Venom - Vortex Viper, Burris Fastfire II or Fastfire III compatible optic on. Red Dot mount fits all XD 9mm handguns. This is the narrow slide model, which fits all 9mm. All other red dot mounts in the industry, rely upon solely a dovetail to fit into the stock rear open optic opening, once the rear sight is removed. There is a design flaw with all optic mounts that rely upon solely a dovetail to hold your optic in place. 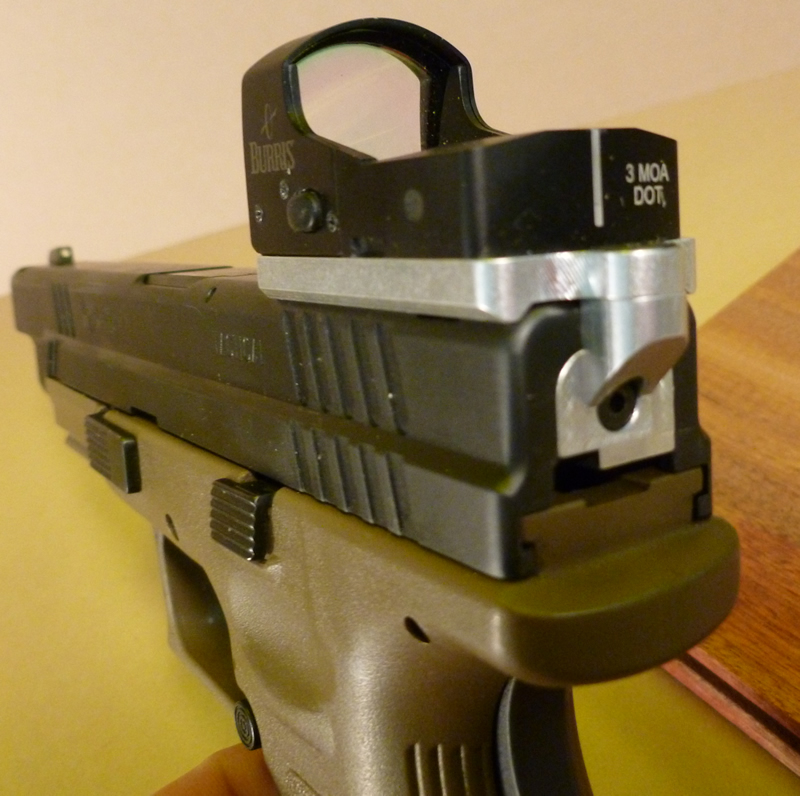 Click here: If you are looking for an Optic Mount for Springfield XDM. First, if the screws loosen whatsoever (which they will after sometimes a mere 50-100 rounds even when Locktite or other thread locking compound is used), the optic will move, and you instantly lose zero and the gun will shoot to a different point of impact. Second, the optic mount will "teeter totter" on the dovetail screw and mounting area if the gun's coating, or any irregularities are machined into the gun. This causes a radical shift, or loss of point of impact. There are a lot of optic mounts on the market.. some go to the extremes, requiring that you machine your slide, some are just a flat plate and a dovetail, that holds in place, but require set screws be shoved into the top of your slide, permanently damaging the finish on the top of your slide, by creating 2 or more divots in the top of your slide's finish, again, permanently messing up your nice gun. The different tolerances between the XD 40 and 45, and the XD9, separate the two models. While both firearms are very close in design, the Springfield XD9mm takes a unique custom optic mount to fit and hug the contours of the pistol All XD 9mm handguns. The length of the slide will not matter. 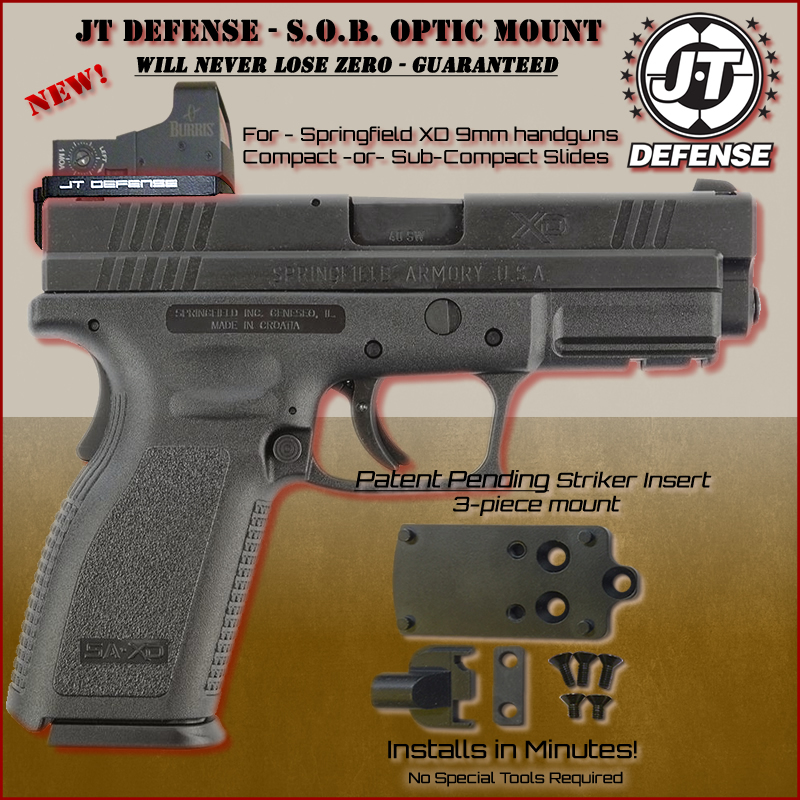 Whether it's a sub compact, or a full size slide, the JT Defense SOB mount for Springfield XD9mm will fit and hug every contour of the gun. This is the only slide mounted red dot optic mount that can be mounted by the user, and will not move. Traditional dovetail only mounts, will rapidly lose their grip on the slide, and the optic will loosen on the slide, causing you to lose zero, and the sight will fall off if not immediately tightened. The image to the right, shows the JT Defense Red Dot sight mount, in unfinished natural aluminum, mounted on a Springfield XD9. All of our JT Defense SOB Optic mounts are Cerakoted for long life, and engraved with JT Defense logo. Fits the following optics: Burris Fastfire II and Fastfire III, Vortex Venom - Viper and most Vortex red dot optics, Docter Optic red dot, JP Enterprises red dot, and more. We are still compiling a list of all optics which will fit the traditional Burris mount. Quite a few optics seem to be designed around this mounting plate design as it's becoming the standard. If you have a question about a particular optic, or want a mount to fit a specific optic, we can manufacture one for you if we get requests. Please Contact Us for more information. NOTE: WILL NOT FIT Springfield XDM Models with Adjustable rear sights! You need a dovetail, standard rear sight mount to fit this red dot mount to fit. We will have a model out for XD/XDM with adjustable sights soon. Please contact us for further details. The Springfield XD and XDM series, polymer frame handguns, are popular pistols in the competition, hunting and target shooting community. JT Defense, manufactures a patent pending revolutionary design, allowing you to install a red dot optic on your handgun, in minutes, without having to go through the expensive, permanent modification to your gun, and without getting a standard dovetail design which will come loose or lose zero. The JT Defense SOB Mount, is guaranteed not to lose zero or require readjustment. The 3 point mounting system, uses opposing forces to keep the optic mount locked on, just as strong and just as stable as machining your slide.. giving you the ability to return your Springfield back to stock. No other mount offers these features. Traditional methods, demand you send your gun out to a gunsmith or custom machine shop, and have your slide permanently modified to accomodate a red dot or reflex optic, or, they require you purchase a simple dovetail design, which is impossible to tighten up, and will come loose with normal use, without even shooting the gun. Just vibration and movement of the pistol, allows the red dot optic to move, or slide around in the dovetail, where the traditional open sights are installed. We solve this, with a unique new mount, securing the red dot or reflex optic, virtually welding it to the slide at 3 solid points, keeping it from ever moving, unless you want to remove it. The 3 point contact, ensures that all forces work against each other in opposing directions, and the optic virtually cannot move.